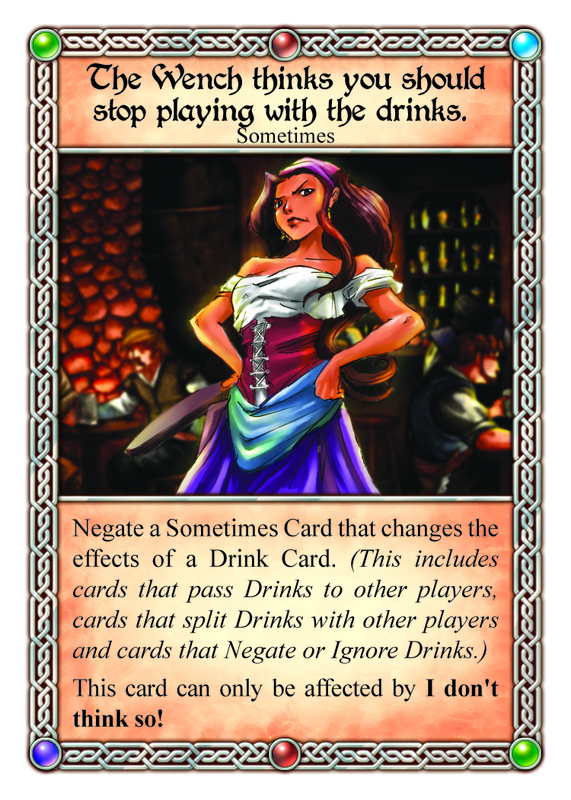 SlugFest Games - RulesFest: Stop Playing With the Drinks! I’ve got a few rules questions about the new Allies characters. When Pooky plays his cheating card that either forces someone out of the round or they take 2 fortitude damage, does Pooky’s mood get worse either way or does it only get worse if the opposing player chooses the fortitude damage. Say Erin is an Elf and she plays that “Druids cannot fight…” card that deals out some fortitude damage and turns her into a bear. The opposing player hits back with something that also causes fortitude damage (like Serena’s “How dare you strike a paladin!”). Erin responds to that with “An eye for an eye” to deal out 2 more points of fortitude damage. My question: when Erin plays that 2nd card, has she already turned into a bear, thus adding 1 more point to the fortitude attack? Or does she not turn into a bear until the entire round of combat resolves (in which case, she would immediately turn into a raven afterwards)? 1. “It’s not wise to upset a druid…” Is NOT a cheating card. The wording is close to identical to “What’s that up your sleeve!” but was left intentionally a gambling card. She isn’t cheating after all, just getting a bit intimidating. 2. “Pooky won’t give up without a fight.” Only causes Pooky’s mood to get worse if the target chooses to take the 2 Fortitude damage and stay in the round. 3. All of the Hit Back cards say that they are playable “After” you take fortitude loss, so Erin’s “Druids cannot fight you say?” finishes resolving, and changes her into Bear form before she can be hit back. Since she is already in Bear form when she responds with “An eye for an eye!” she will cause 3 Fortitude loss and then become Raven (unless the card is Negated by “I/We don’t think so!” or “Temporal Dilation” or “Wildshape”). TL;DR – 1. Not a cheating card. 2. Pooky’s mood only gets worse if someone takes the damage. 3. Erin is a bear when she hits Serena back.